This 110V Generator is a quiet, powerful, portable solution to emergency power. 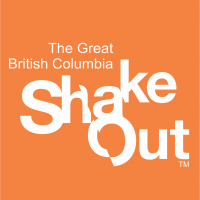 Say goodbye to fumes and noise and go electric with your emergency preparedness. The lithium-ion batteries are lightweight and yield long runtimes. Power everything from your lights to your fridge! 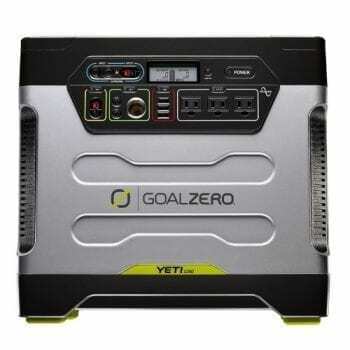 The Goal Zero Yeti 1400 Lithium uses next-generation technology to give you a safe, powerful, high-quality energy option for emergencies and outdoor activity. 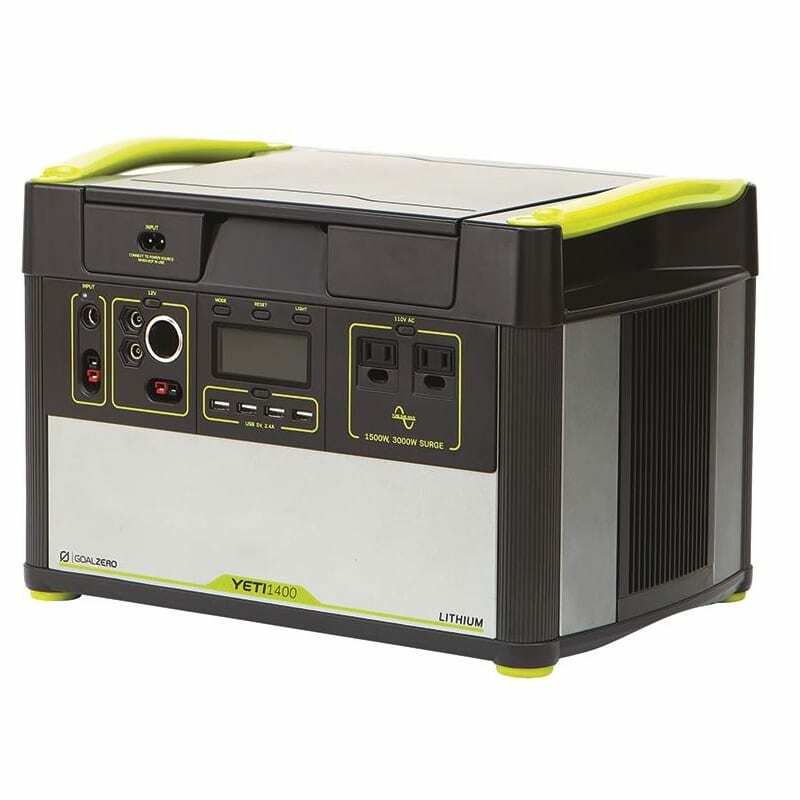 One of the most versatile and innovative power stations on the market, the Yeti 1400 was built from the ground up. Built-in surge allowances and multi-stage protection means incredible compatibility with devices ranging from lights and laptops, to refrigerators and power tools. The AC inverter is equipped with multi-stage surge capability that sets a new industry standard for portable power. From USB to AC outputs you can plug and play with more devices than ever – power tools, water boilers, refrigerators, and more. 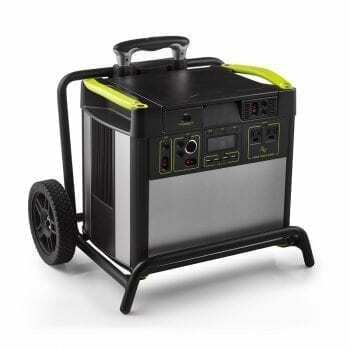 The generator can be charged by solar panels and/or directly from the wall. For standard or light use (approximately 30-40% of the generator’s power each day) we recommend 1x Boulder 100 solar panel. If you are planning to use a lot of power, adapters can be purchased to connect up to 6 Boulder 100 panels to suit your needs. With the award-winning information display you get real-time usage data when you need it. Information available includes runtime/recharge time estimator and an input/output meter. The lithium cells in the Yeti 1400 feature additional monitoring for superior management and safety so you can rest easy. These batteries also yield long runtimes and are lightweight in comparison to their lead-acid counterparts. It is recommended that the Lithium Yeti be plugged in (AC or solar) as often as possible to prolong the life of the battery. Without regular charging the battery will hold power for 10-12 months. *Please note that Boulder 30, 60, and 90 solar panels have been discontinued. Adapter kits can be special ordered to connect up to 6x Boulder 100 panels for maximum solar input. For more info please email [email protected] or call us at 1-888-832-1733. Smartphones, Lights, Camera Equipment, Tablets,12V Appliances, Laptops, CPAP, Display Monitors, Blenders, Speakers, Drills, Grills/Smokers, Power Tools, TV/Electronics, Fridges, etc. 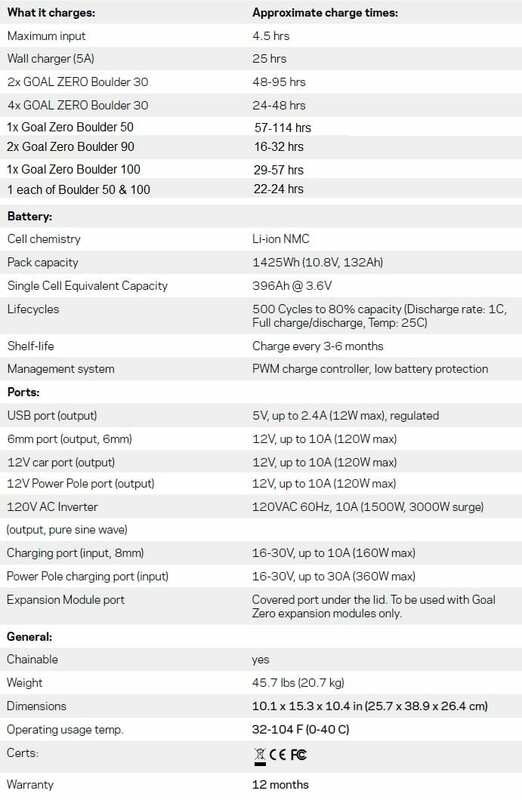 How Long Will it Take to Charge Your Device From Goal Zero Products?